"Nighthawks" is the latest release from Andrew Rayel's new record label, inHarmony Music. No matter where the listener may fall on the electronic music spectrum, it’s safe to say that the song’s poignant lead melody will remain in listeners’ minds long after it’s heard. Urgent. Exacting. Incendiary. Like a cyclone barreling down out of the blue, “Nighthawks” is a predatory tune impossible to ignore. Its creator, Leo Reyes, shows himself early in 2018 with a single sure to dominate nightclubs and music festivals. 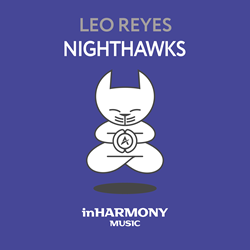 Leo Reyes’ “Nighthawks” (inHarmony Music) is out now. A thunderous synthesizer lays the groundwork on the Original Edit of “Nighthawks,” signaling a vicious musical journey ahead. The memorable chord progression mimics an elemental call-and-response, forming an enthusiastic melody that pierces the air. Label chief and mainstage DJ/producer, Andrew Rayel, has been playing “Nighthawks” out in his live sets for the past several months, and each time, the crowds erupt in affirmation. The Extended Mix leaves a bit more on the intro and outro, resulting in a track of nearly a minute-and-a-half longer. This version is perfect for ambitious club DJs who want to play it out in their sets. In either version, “Nighthawks” succeeds in melding the best of trance, serving up a soundscape with dynamic dimension. No matter where the listener may fall on the electronic music spectrum, it’s safe to say that the song’s poignant lead melody will remain in listeners’ minds long after it’s heard. Born and raised in Guadalajara, Mexico, Leo Reyes has taken cues from such trance and progressive-house music heavyweights as Eric Prydz, Deadmau5, Markus Schulz and The Chemical Brothers. Reyes’ three-song EP, Wide Open, was released in 2016 on Abstractive Music. The title track of that EP had enjoyed support from Armin van Buuren’s ‘A State Of Trance’ (ASOT) radio show two years earlier, paving the way for Reyes to make his mark on the dance music scene. With Reyes’ 2018 release arriving by way of trance icon Andrew Rayel’s record label, inHarmony Music, the former’s immediate future in electronic dance music shows great promise. For information on Andrew Rayel, Fatum, MaRLo, Ryan Farish, NOA | AON (Pavel Stuchlik), Maro Music (Marek Walaszek), Paul Damixie, NativeOrigin303, NKRIOT, Alex Ariete, Brussels Airlines (proud partner of Tomorrowland), and artists like Armin van Buuren, contact EMILY TAN Media Relations (U.S.), +1(917) 318-3758, EmilyEmilyTan(at)aol(dot)com. Follow EMILY TAN Media Relations on Twitter @EmilyEmilyTan and LinkedIn http://www.linkedin.com/pub/emily-tan/4/342/70b.